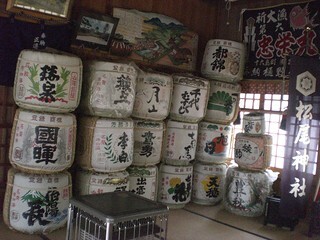 On our way to Izumo, we stopped at Saka Shrine, dedicated to the god of sake. . .. According to 8th century documents, the Gods may have partied really hard here for 180 days, but now it is just a very quiet shrine dedicated to the sake god. Instead of deities, the Izumo Toji, or brew masters of the Izumo Guild, hold monthly meeting at the shrine. Passing through the stone torii gate and walking up the woodsy stairs, the only thing you hear is roosters.